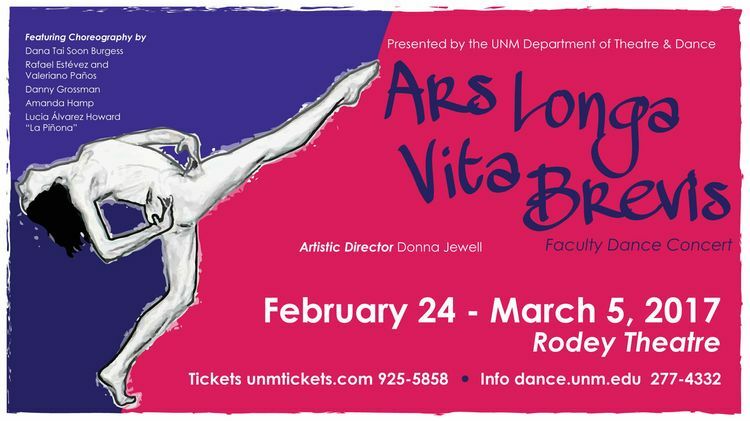 The UNM Department of Theatre and Dance begins its spring production season with the faculty dance concert ARS LONGA (vita brevis), Feb. 24 through March 5 in Rodey Theatre. When the concert’s artistic director, UNM Head of Dance, Donna Jewell was asked why she chose the title (which translates as Art is long, Life is short) she said, “Art sends a strong message in troubled times. It lasts longer than any of us.” Works on this concert include an historic re-staging as well as vanguard choreography in flamenco and contemporary dance choreography by Dana Tai Soon Burgess, Rafael Estévez and Valeriano Paños, Danny Grossman, Amanda Hamp, and Lucia Álvarez Howard “La Piñona”, international guest artists and UNM’s distinguished resident faculty. Throughout his career, Burgess has performed, taught, and choreographed around the world. Dana Tai Soon Burgess Dance Company (DTSBDC) marks its 25th anniversary in 2017 with performances, master classes, an international tour, and two world premieres at the National Portrait Gallery, where Burgess is the Smithsonian’s first ever choreographer-in-residence. The rehearsal director for Leaving Pusan is Kelsey Paschich. The cast is Peter Bennett, Madrone Matysiak, Kellie Walsh, Elicia Larribas, Justice Miles, and Julie Colleen Abeyta. Also on the program will be an historic re-staging of Ecce Etude, by renowned Canadian choreographer Danny Grossman, with Lisa Nevada and Jacqueline Garcia as rehearsal directors. Laura Bennett from the American Dance Legacy Initiative, visited UNM to work with UNM dancers Elicia Larribas, Imeh McIver, Madrone Matishak, Natesa McGowan, Kiersten Johnson, Samantha Katz, and Mariah Baker to help prepare them for the concert. Ecce Etude is a part of Ecce Homo (Behold the Man) that premiered in 1977 which was inspired by religious paintings and sculptures of Michelangelo. Ecce Etude is part of American Dance Legacy Initiative’s Repertory Etudes Collection, conceived and curated by Carolyn Adams and Julie Adams Strandberg. This performance of the Ecce Etude was made possible through a partnership between American Dance Legacy Initiative (ADLI) at Brown University and the Dance Program at the University of New Mexico. 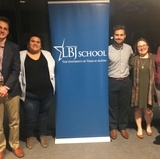 In the summer of 2016, MFA graduates Jacqueline Garcia and lisa nevada traveled to New York to work with ADLI Dancing Legacy Director Laura Bennett and to be coached by original Grossman Company member Eddie Kastrau and the choreographer Danny Grossman. They returned to Albuquerque to share this choreography and ADLI’s unique teaching method with students at UNM. The performance of the Ecce Etude is the result of this extraordinary process. The project director is Mary Anne Santos Newhall. Amanda Hamp has set a new work titled The northern sky, a westward facing window. Provoked by Harriet Jacobs's self-confinement to a 7x9-foot garret in her grandmother's home—part of her plan to secure her freedom—this piece explores moving through smallness to access expansiveness, and the journey of coming home to ourselves. Composer Stuart Smith has created a new musical score for this work, combining original material with alterations of existing songs. Dancers are Julie Abeyta, Dune Alford, Mariah Baker, Noelle Encinias, Liz Groth, Rocki Jian, Sam Katz, Julianna Massa, Imeh McIver, Dante Morning-Star and Kellie Walsh. Set designed by Inseung Park and lighting by Bill Liotta. ARS LONGA features two works by three visiting flamenco artists who developed these works while in residence at UNM. Çiertas Danças is an original idea, concept, repertory, and choreography by Rafael Estévez and Valeriano Paños. This work consists of three movements, Folía, Jácara, and Fandango. 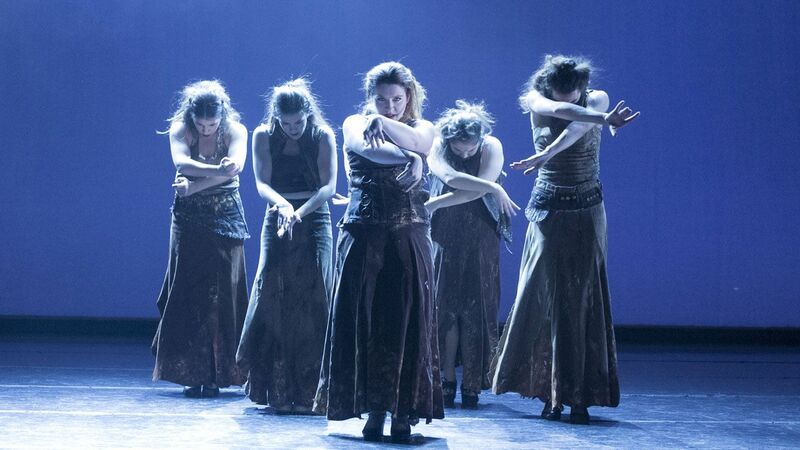 The piece contrasts feelings of old and new that exist simultaneously in both the movement vocabulary and costuming. Estévez and Paños are among the most highly regarded choreographers in Flamenco/Spanish dance today. 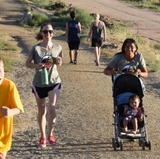 They were in residence at the University of New Mexico for four weeks in the Spring of 2016. The rehearsal director is Marisol Encinias. Dancers are Brittany Bird, José Encinias, Nevarez Encinias, Noelle Encinias, Fiona Featherston, Eloy Gonzalez, Elena Heiss, Andrea Lozano, Zahra Marwan, Samantha Mascareñas, Corrina Roche, Roberto Trujillo, Merlot Visocaro, Sophya Yamplowsky, with understudies Andrea Sanchez and Jonathan McVey. La Serrana, choreographed in the fall of 2016 for the University of New Mexico’s Dance Program during the six-week artist residency of Lucia Álvarez Howard “La Piñona” and Eva Ruíz is staged for five women. Eva Ruíz was instrumental element, as she sang during the construction of this work. La Serrana is based on a traditional structure for flamenco dance, however the choreographer played with the idea of staging this traditional work on five women, utilizing geometric shapes in the staging and playing with relationships created as people dance together on stage. The verse in this song poetically talks about the beauty of a woman who is from a mountainous area of southern Spain. The choreographer, Lucia Alvarez “La Piñona” was drawn to this music because of her ties to this region of the world. This piece is interesting in the way the choreographer demonstrates qualities of strength, delicacy, solemnity and ferocity. It is a stunning representation of feminine beauty. The rehearsal director is Marisol Encinias, with dancers Noelle Encinias, Merlot Visocaro, Andrea Lozano, Fiona Featherston, and Brittany Bird. Understudies are Andrea Sanchez, Zahra Marwan, Sophya Yamplowsky, Samantha Mascareñas, and Corrina Roche. Performances of ARS LONGA are Feb. 24, 25 and March 2, 3, 4 at 7:30 pm and Feb. 26 and March 5 at 2:00pm in Rodey Theatre, located in the Center for the Arts on UNM’s main campus. Ticket prices are $15 General admission, $12 UNM Faculty & Seniors, and $10 UNM Staff & all Students. Tickets are available at the UNM Ticket Offices located at the UNM Bookstore, Central and Cornell, or the Arena (The Pit), University and Avenida Caesar Chavez, and by calling (505) 925-5858. Tickets may also be purchased online. For more information, visit UNM Department of Theatre and Dance or call the theatre office at 505-277-4332.